I am a beginner with the chef and slowly diving deep into it. I have a doubt regarding the "source" attribute of the resource "Package". The documentation says the "source" attribute uses local file system stored files and not HTTP or FTP. I have a 'TOMCAT tar' file and 'Java RPM' package to be installed on nodes. You are missing a lot here. The package resource is used to declare packages you want to install and you don't have to tell chef how or where to get the package you declared to be installed. Chef will use your local system repo using your distro package manager to do this, but you don't need to tell chef this. Also you wouldn't need the tomcat and java file in the file directory in that case. it will figure it out it self. 1) Use the cookbook_file resource to transfer files from a sub-directory of COOKBOOK_NAME/files/ to a specified path located on the remote host that is running your chef-client. command "tar xf /opt/apache-tomcat-9.0.0.M22.tar.gz -C /opt --strip-components=1"
The source on a package is a plain ol' local filesystem path. If you want to use something from a cookbook you need to use it alongside a cookbook_file resource. However we really don't recommend this. Chef is not a very good file distribution system. It will work, and on small scales it's okay-ish but it's really not going to be pleasant over the long term. For packages, you could host an internal Yum repository somewhere on your network and use Chef to configure it via the yum_repository resource. Not the answer you're looking for? Browse other questions tagged chef chef-recipe . How does chef know how to install a package from its package name? 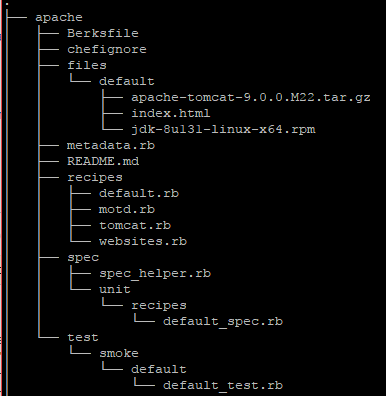 Why create ruby libs to manage simple config files in chef ?